The Associated Press projected that Hillary Clinton was the presumptive nominee of the Democratic Party on Monday — a day earlier than she was expected to clinch — because they determined that she won the support of the key number of delegates: 2,383. The Associated Press projected that Hillary Clinton was the presumptive nominee of the Democratic Party on Monday — a day earlier than she was expected to clinch — because they determined that she won the support of the magic number of delegates: 2,383. Q: How did she clinch? A: Clinton went over the top with the support of around 20 additional superdelegates, the officials who represent about 15 percent of the delegates to the Democratic convention. These delegates did not previously commit to Clinton, but pledged their support to her in interviews with AP. 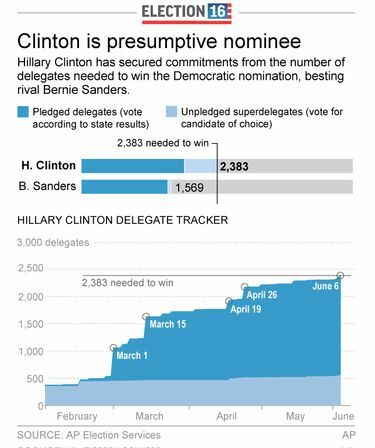 Overall, the 2,383 delegates who support Clinton include 1,812 pledged delegates — those bound based on the results of the primaries and caucuses — and 571 superdelegates, according to the AP count. AP provides delegate counts and election results to many news organizations, including The New York Times. Sanders trails by more than 800 delegates. He holds 1,569 delegates, with 1,521 pledged delegates and 48 superdelegates. Q: Was this expected so soon? A: No one is surprised that Clinton has clinched the nomination. It’s just a surprise that she did it on Monday night. After winning Puerto Rico, Clinton was not far from winning the nomination. It wasn’t much of a secret that Clinton held the support of the superdelegates needed to clinch. But it is widely believed that the Clinton campaign did not want to win with added support from unelected delegates, which might feed the perception that the Democratic race was rigged or otherwise determined by party elites, not the voters. If no additional delegates had supported Clinton, she would have gone over the top shortly after the polls closed in New Jersey, around 8 p.m. on Tuesday. The state is worth 126 pledged delegates, and she was a heavy favorite in the state. Q: Can’t the superdelegates switch? A: Yes, the superdelegates are not bound to their pledges. This is why the Sanders campaign argues that Clinton can’t clinch the nomination until the convention in July. It’s also why the news media characterizes her as the presumptive nominee; she won’t officially be the nominee until a convention vote. But superdelegate pledges aren’t irrelevant, either. The pledges aren’t binding, but superdelegates know what they’re doing: They know that their pledges are monitored by news outlets, and that stating their support might ensure that Clinton would become the presumptive nominee. AP has repeatedly interviewed superdelegates, so it’s not likely that there’s a big pool of delegates who pledged to her a year ago and have since switched. If anything, these early supporters are likely to be her strongest backers. And history provides reason to take them seriously. In 1984, Gary Hart failed miserably in trying to change superdelegates’ minds in his race against Walter Mondale. The news networks projected that Barack Obama was the presumptive nominee in the 2008 Democratic primary based on the same rules for tabulating superdelegates. Clinton did not decide it was worth taking the fight to the convention. Q: Would Clinton win without superdelegates? A: Well, not Monday. But she would have won Tuesday if no superdelegates existed. Not only would Clinton have won without superdelegates, but they were actually Sanders’ only hope of winning. That’s because Clinton has a considerable lead of 291 elected delegates, pledged based on the results of caucuses and primaries, according to the AP count. Clinton earned her lead by winning more contests than Sanders, and she usually won by wider margins in races worth more delegates. In fact, Clinton won 13 of the 15 biggest delegate wins of the cycle. With just seven contests left, Sanders would have needed to win around 70 percent of the remaining vote to capture a majority of those pledged delegates. He’s only hit 70 percent in one primary: his home state, Vermont. That meant Sanders could win only if superdelegates decided to overrule the preferences of voters and support a candidate who lost the primaries. According to our projections, he might have needed to win about 70 or 75 percent of superdelegates at the convention in order to overcome Clinton’s lead in pledged delegates. It was never likely that superdelegates who supported Clinton would bolt for a candidate who lost the primary, let alone one who rails against the establishment. It’s even more unlikely after the AP call: Sanders’ only hope was that the superdelegates would break his way, but they’re actually moving to Clinton. Q: Will this affect Tuesday’s results? A: Quite possibly. It’s not hard to imagine how the AP race call might depress turnout among the supporters of either candidate. Who will it hurt more? It’s purely a matter of speculation. One could argue that Clinton would benefit, since she has more regular and reliable voters. On the other hand, perhaps Sanders’ supporters will be newly motivated to defy the party’s establishment at a moment when Clinton’s supporters will be complacent. Here’s one thing that’s clear: Clinton has banked a considerable lead in the early vote in California. If Election Day turnout is down in California, those early votes will represent a larger share of the electorate.